Flirty Harry With His Ex Girlfriend Felicity and Baby. . Wallpaper and background images in the Harry Styles club tagged: harry styles. 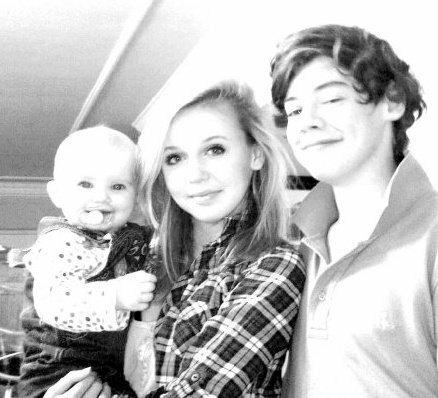 It's mine and Harry's baby, ACTUALLY! Hey no1 be sad cuz its not their baby! he's just a teenager! Seriously gals, i cant believe it. are you kidding yourselfs? You should be happy if he has a girlfriend. I dont think he´ll ever end up with any of you´s. I am speechless, lost for words when I read stuff like that. If he has a girlfriend you should be happy for him coz that means he found love, he actually found someone who he can love. It´s so damn heard in the music industry to actually date someone. i mean even zayn had to sneek out on dates.. Seriously if u tell that you love the lads so much you should just be happy for them. Not pick on their girlfriends how much you hurt them, coz i think that will hurt the boys too. ugh i hate harry more and more by the minute.....i used to luv this guy but the way hes been acting lately.....no. I agree with Superhero_. If you can't be happy for the boys when they think that they have found the one then you aren't truly directioners. If you can't be happy for the boys when they have a girlfriend or boyfriend then that means that you don't love them. BE HAPPY FOR THEM. WHAT HAVE THEY DONE FOR YOU TO HATE THERE CHOICE IN PEOPLE! Be happy. That's all they and all of the TRUE directioners ask for and if you don't like it, well, then you aren't a true directioner! I got upset when Harry got his girlfriends but I was happy for him. Even though he is my favourite it doesn't mean that I give his girlfriends hate, it means I am happy for them. If you want to say hate to the girlfriends or boyfriends of people, DO IT IN YOUR HEAD! Instead of only caring about yourself, you need to care for other people as well. Be true directioners and be happy for the boys!